Esbit Alchohol & Solid Stoves Alcohol Stove EAB300BR. 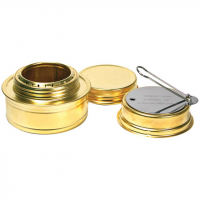 The packable Esbit Alcohol Stove and Trekking Cookset provides a number of essentials for cooking out on the trail, including an alcohol burner and 2 pots, one of which doubles as a lid for the other. Esbit Camp & Hike Cookset (585 ml) ECS585HA. The windsheild stand can be stowed inside the pot in a space-saving way. Windshield is suitable for use with Esbit solid fuel (not included). Ideal for your home or auto emergency kit, this pocket-size Esbit stove folds down to a small, compact size. Esbit Alchohol & Solid Stoves Pot Stand & Folding Stove ECS75S. 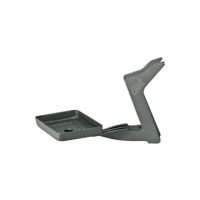 Its lightweight compact and multifunctional making it an ideal companion for the trail or an emergency preparedness kit. 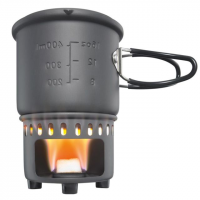 The Esbit Solid Fuel stove and cookset is a great choice for heating up water or making simple meals on fast and light adventures in the mountains. 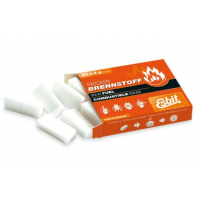 Use these solid fuel tablets for your Esbit stove. The nontoxic, nonexplosive formula is virtually odorless and smokeless. 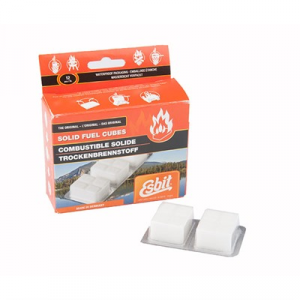 Esbit Stove Accessories Solid Fuel Tablets - 20 pk EFUEL20X4. 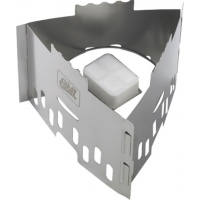 Esbit Alchohol & Solid Stoves Titanium Solid Fuel Stove ESTOVETI.